The Buddha and his followers appear in art with various attributes; special clothing, objects, or other traits that identify them. How many of these attributes appear on MAG's Buddhist works of art? The ushnisha (oos-NEESH-ah) looks like a top-knot hairdo. Actually, it represents a swelling of the top of the head caused by the achievement of ultimate understanding, as if the head cannot hold so much knowledge. The urna (OOR-nah) is a "third eye," representing increased wisdom and ability to see beyond earthly existence. Closed or castdown eyes avoid worldly distractions and help to focus attention inward. Bare earlobes, still stretched by the heavy earrings worn in the Buddha's princely youth, stand for the rejection of earthly riches and power. 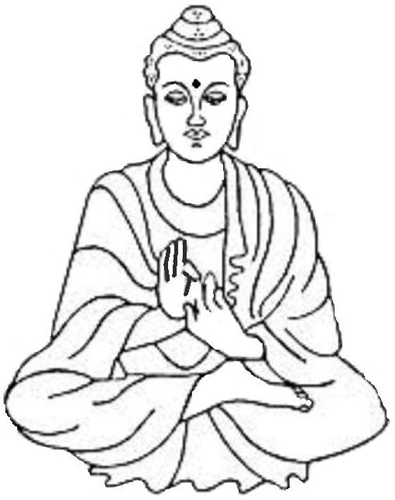 The mudras (MOO-drahs), special arrangements and poses of hands and fingers, are important symbols in Buddhist art. This seated crossed-leg pose, known as the lotus position, is commonly used to convey calm and relaxation.